Safari to lake Nakuru with its Classic safari, Big 5 present, famous for its flamingos, and in the Masai Mara Classic safari, Big 5 present (rhino rare), Many big cats, wildebeest migration and then to the Pink Lake often referred so due to its Great masses of Flamingos and Samburu game reserve with its Classic safari, 4 of Big 5 (no rhino), adjoining Buffalo Springs without fences. Pick up you in the morning from your hotel and depart by road driving through the rich Kikuyu farmlands to the edge of the Rift Valley. Descend the escarpment and drive via Masai town of Narok to Masai Mara Game Reserve with picnic lunch served en route. The Masai Mara is classic African savannah, And the sheer density of wildlife is amazing. Masai Mara is famous for its Black manned Lion and yearly migrations of Wildebeest and Zebra, Elephant, Buffalo, Rhino, Gazelle, Leopards, Giraffe are also found here. Afternoon game drive. Dinner and overnight at our safari camp. Spent the whole day game viewing in Kenya's finest wildlife park, the Masai Mara National Reserve. Our morning and afternoon game drives take us in search of Africa's Big Five. 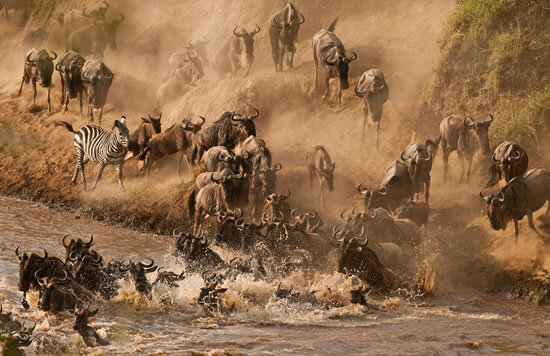 The Masai Mara Game Reserve is 1510km² of incredible wide-open landscapes and fertile riverine woodland following the looping meanders of the Mara and Talek rivers in Kenya. One glimpse is enough to explain its appeal; it is typical open savannah, with a mass of amazing wildlife. Hot-air balloon trips are an entirely outstanding way of seeing the savannah plains teeming with wildlife. These Masai Mara balloon trips can be arranged at extra cost of USD 450. We overnight at the same safari camp near Masai Mara as on day one. After breakfast, depart Masai Mara game reserve for Lake Nakuru national park with Picnic lunch en-route. On arrival check in at Lake Nakuru hotel. Short nap will be followed by an afternoon game drive. 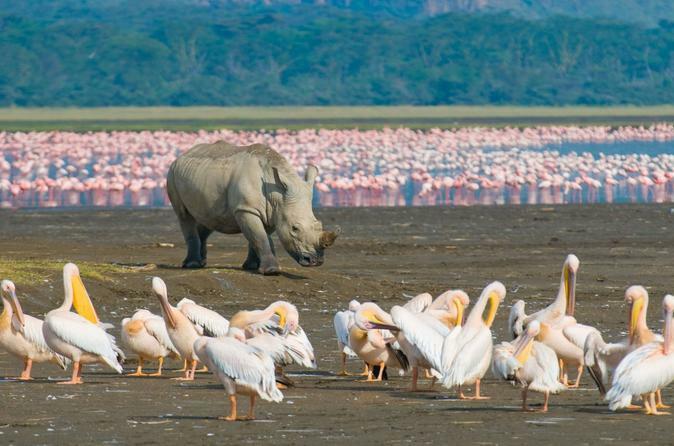 Lake Nakuru national park which is famous for its pink Flamingos and many other types of birds. There are rare species of animals the white rhino and Rothschild giraffe among a wide variety of game. Dinner and overnight at Lake Nakuru hotel. Depart lake Nakuru national park after breakfast proceeding to Samburu game reserve on the fringes of the semi-arid northern frontier district of Kenya. Picnic lunch will be hosted at the Thomson falls. The scenic Nakuru – Nyahururu road passes through the hub of Kenya food basket and an insight of the living situation of the local population is visible. Arrive Samburu in the late afternoon. Game viewing en-route to your to the camp. Dinner and overnight in Tented camp. Whole day spent in Samburu game reserve. The arid conditions have provided habitat for distinct animal survival. Here we find animals resident to this park only like reticulated Giraffe, the Gravy zebra, the Gerenuk, Somali ostrich, lion, elephants, cheetah, buffalo and crocodiles at the Ewaso Nyiro river which is the lifeline of the Samburu game reserve. Other species of game are also found. All meal and overnight in same tented camp. Early morning game drive and later come back to the camp for breakfast. An optional game drive before the return journey to Nairobi with lunch en-route. After lunch drive to arrive Nairobi in the early evening. Drop-off at your resident hotel or airport.